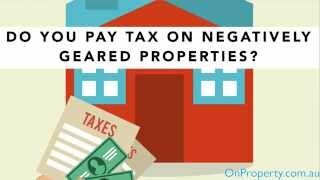 Do You Pay Tax On Negatively Geared Properties? Do You Pay Tax On Negatively Geared Properties? A negatively geared property has more expenses than income and thus loses money. So do you pay tax on negatively geared properties or are you eligible for a tax refund? Negatively geared property is an extremely common investment strategy in Australia and there are a lot of people investing in negatively geared property mainly for the capital gains benefit. But do you pay tax on negatively geared properties? The short answer to this question (because I know you guys love short answers) is: only when you sell the property. In almost all circumstances you won’t pay tax on a negatively geared property while you own it. However, when you sell the property you will likely need to pay capital gains tax. Before I go into more detail I just want to put out a disclaimer that I am not a tax accountant and this should not be considered taxation advice. When it comes to tax related things always seek a professional to do your tax return. Now generally property profit is added to your taxable income when you own the property in your own name. But a negatively geared property makes a loss by its very nature. The reason it’s called a negatively geared property is because it makes a loss every single year. So when you usually add property profit to your income what are you going to do with the loss? Well the loss is usually deducted from your taxable income which makes your taxable income smaller. So because you made a loss it gets taken away from your taxable income and it makes your taxable income smaller. Plus you also get to consider depreciation which can get taken into account and make your loss bigger. Therefore you can take that away from your taxable income and you will often get a tax refund (again this is not taxation advice and there’s no guarantee so always speak to a professional accountant). So often times negatively geared property will lead to some sort of tax refund for you. However you will likely need to pay capital gains tax. If you own a negatively geared property for a long period of time (or even a short period of time), the property goes up in value and you sell that property, then you’ve made a profit on that property by it increasing in value. You are therefore going to be eligible to pay capital gains tax which is a tax you have to pay on the capital gains. So do you pay tax on negatively geared properties? Generally it saves you tax due to the loss each and every year. However you do pay capital gains tax when you sell the property. If you want to find or learn how to find positive cash flow properties (because maybe negative gearing isn’t your ideal investment strategy or you want to mix it up with negative gearing properties and positive cash flow properties) then I can teach you how to find positive cash flow properties in Australia. Just go to www.onproperty.com.au/free and check out my free eCourse on exactly how to do that.